Very few know that the ‘dome’ was the name by which the stately home of the Wingfield family was known. In occupation until the late 1800’s, the Wingfields built this spectacular mansion on a large 107 acre site, on a beautiful inlet of the estuary overlooking the ‘Grand Old River Moy’, one of the most idyllic places imaginable. It was later acquired by Philip Boyd of Castletown who in turn sold it to his brother-in-law Oliver Jackson in the early 1900’s. Oliver transformed the ‘dome’ into a hotel which is said to have made Scurmore proud and the envy of many other places. The two story hotel building had a large entrance with a magnificent Gothic arch; it also boasted four tall chimneys, which was a sure sign of opulence in those days. The roof was slated and the lower level decorated with brick architrave, and there were nine large windows on the front façade with the upper windows being partially dormer. Access to the hotel was by a long winding driveway from the main road. Boasting the height of luxury each of the twenty bedrooms had hot and cold running water and an open fireplace, which the staff would light for the guests. A long maple-floored private ballroom dominated the interior, and it was in this most spectacular of rooms that Super Dances were usually held at important times of the year, such as Easter and Christmas. Non-residents were admitted, but at a cost of ten shillings, which in those days was quite expensive and prohibitive to most. Despite the cost, these dances were very popular and noted for their large attendances, and one had to book well in advance to be sure of a ticket. It is easy to understand why Scurmore House Hotel very quickly gained a great reputation and was visited by the more ‘well to do tourists’. It was purchased by Pat Caffery in 1930, and extended with the addition of a new ballroom. In June that year Hotel Dances began and quickly became very popular and hugely successful. Caffrey then sold the hotel to an English family named Pullar, who afterwards sold it on to the Gourlay family, before it was bought by Martin Gilroy, who was the last person to run it as a hotel. 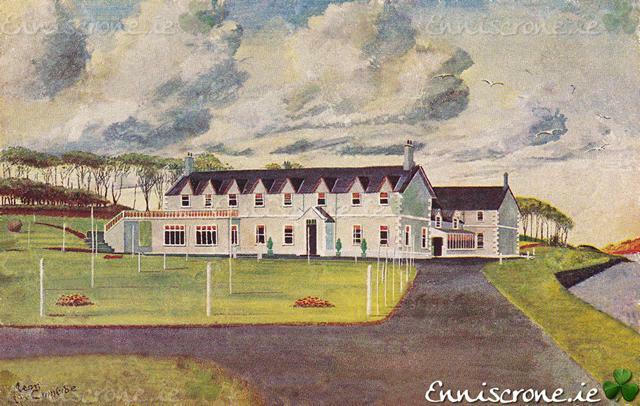 Scurmore House Hotel closed its doors to the public towards the end of 1952. In 1953 the estate was sold off in three separate lots. A schoolteacher, John Joe McHale bought the house and eleven acres, apparently with the intention of selling it on to a religious order. However, as with some of the best laid plans of mice and men, this did come about, and his only customer turned out to be a demolition firm from Mohill, who when they were finished left just an empty shell standing.